Okay, so, maybe I’m being dramatic. But he came terrifyingly close to nearly drowning. It all happened so quickly and I was completely oblivious, despite the fact I was standing in the water with him less than a meter away. One moment I was having a chat with a friend in another friend’s backyard pool and the next moment she was lunging across to my son and pulling him, coughing and spluttering, out of the water. And I thought I was watching him the whole time. I mean, I could see him, out of the corner of my eye. His head was above the surface. So he was fine. Or so I thought. Retrospectively, in the moments before my friend dove at him and yanked him out of the pool, I could see him jumped up and down beside me. Up and down. Up and down. That looks like a kid who’s just having fun, yeah? Just bouncing around in the water. What really happened was his mouth and nose were just under the water, every time he jumped up he tried to call for help, but all he could do was take a breath before he went back down. Over and over. Bounce. Bounce. Bounce. The point where my friend grabbed his was when he stopped bouncing and was just standing, face deep in the water. He’d stopped moving. His body was starting to conserve energy. It’s called an Instinctive Drowning Response. He was starting to drown. That’s what drowning really looks like. It’s silent. And subtle. It’s stillness. Not shouting, waving, and calling for help. …of the approximately 750 children who will drown next year, about 375 of them will do so within 25 yards of a parent or other adult. That said, it’s been a few years, I’m not beating myself up too harshly about this anymore! However, it was an important lesson for me to learn. And I’m so glad I was able to learn it without catastrophic consequences. We were all a bit shaken, but he was back in the water within a few minutes. Laughing and playing. Though I was keeping a close eye on him for any changes in his behaviour or any sign of illness, because of the risk of “Dry Drowning” or “Secondary Drowning”, which can happen hours or even days after accidentally inhaling water. But he was fine. Even though it gave us all a fright this really did all take place over a few seconds. So he was perfectly okay. Some parents are not so lucky. According to the Royal Life Saving Society drowning is one of the biggest causes of death for children under four years of age in Australia. I think everyone in Australia is familiar with the Kids Alive Do the Five song, yeah? But it’s something all parents need to know and remember. Fence the pool – most drownings with children happen in backyard pools. Shut the gate – According to this study in Australia 18.2% of drownings of children aged 0-4 years the gate had been propped open. 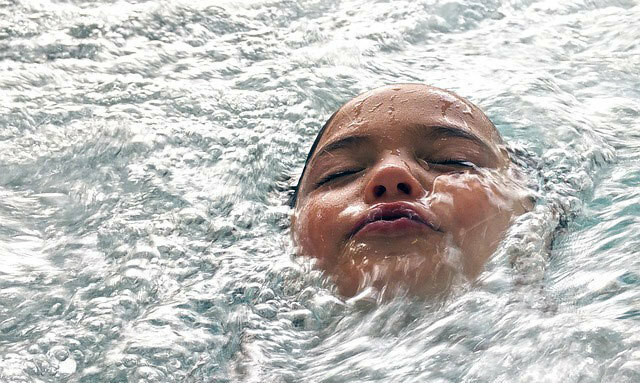 Teach your kids to swim – but just because they can swim doesn’t mean you should be complacent. Supervise – In all drownings of children under 4 supervision had lapsed or was completely absent. Supervision is the main way to prevent drowning. And “Active” supervision. Actually watching them. Not just being nearby in the water with them in your peripheral vision. Learn How To Resuscitate – I recently updated my CPR training and the trainer actually said that the success of CPR depends on why the person stopped breathing in the first place, and drowning – if caught in time – is one of the occasions where CPR can be incredibly effective. Attila Bóvári, Michelle Murphy, Danielle Cunningham, Yasmin Green, Liz De Prose, Tonia Marie, it’s worth a read. A Valadia Cooper remember when Kalina jumped in the pool without us seeing? Same thing, I remember there were at least three of us standing RIGHT THERE! Thank God you looked down when you did. My 8 year old who’s a good swimmer just did that the other day. We were in the pool together. Just the 2 of us, mucking about. He did it while i was actively watching him. I thought he was just playing. He was less than a metre from the edge and within arm’s reach. I’ll say again: he can swim well. Thanks to articles like yours and the one linked in your article i recognised what i was watching on his 4th bounce and pulled him straight to me. He had gotten a little spooked because as we were playing he was pushed under just a tiny bit without being able to catch a breath before. That was enough for him to panic to the point where he couldn’t swim and was just doing the bounce, trying to stay upright with his nose above the water. Eeeeek! So glad it all worked out ok! Swimming lessons are great. Being able to swim is also just a good skill to have. Plus it tires them out! That would have been scary. Everyone needs to read this. It’s so true, but because it is often portrayed in media as a big, splashy, noisy thing, most parents have no idea how silent it is. I remember almost drowning as a kid in the wave pool at Wet’n’Wild. It was my big sister next to me who saved me, pushing and pulling me out of the waves as best she could while signalling for help. My older brother almost drowned when he got caught in a rip. My dad was in the water and had him out by the time the lifeguards hit the waters edge. My older sister, the same one who saved me, almost drowned at 2 years old and it only took seconds. She was underwater, her big eyes looking up. No sound. My daughter slipped in the pool at 2 years old, went under and there is no way she would have splashed or signalled. I was right in front of her so grabbed her and pulled her straight up, but she could have been gone within seconds. I’m glad it didn’t spook her and she got straight back in. We had a pool party for my kids and a mother turned to unpack a bag while I watched the 8 bigger kids in front of me in the pool. Just behind me I felt the water move and turned to see her 3 year old slip into the water. No sound and she could not swim up to splash or anything. It was only a second but she coughed for a bit and if I hadn’t felt the water move behind me I might not have noticed. Oh so scary. I’m glad everyone was okay! It really is just so quick and silent. It does feel dramatic, but really the difference between a bit of a fright and something catastrophic is a few seconds. Omg! I’m a bit jumpy at swimming lessons at the moment because my daughter has just moved to a deeper pool, and she can’t really swim yet. I keep reassuring myself that she can’t drown with the instructor right here. But that’s so scary! What a terrifying experience for you – I’ve read this before and it’s so important to share around. Swimming or being near water definitely isn’t relaxing experience with kids around! Such an important reminder. My heart is in my mouth any time we are near water. This is so scary! This is such important information to know and share! So scary. It’s my biggest fear. My father and brother drowned. I was a witness. Drowning doesn’t look like drowning, it looks exactly as described in the Instinctive Drowning Response. No calls for help, no flailing, no looking towards help, just instinctively trying to live.